I'm getting ready for my team meeting next week, so my table is filled with September SOTM right now. 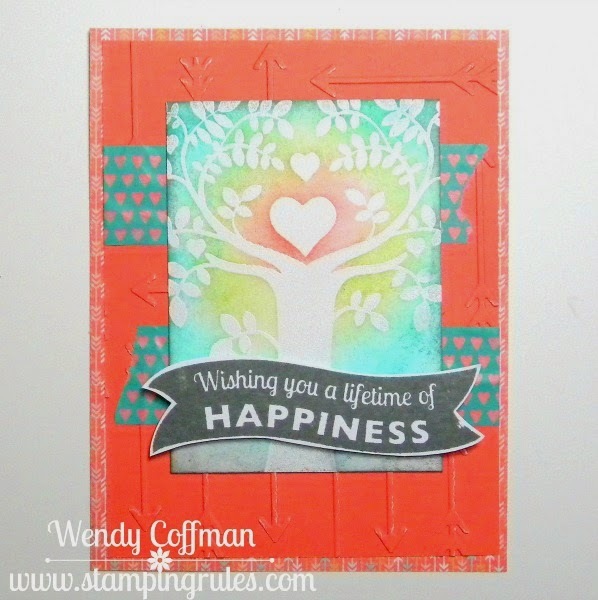 I wanted to something with heat embossing, so as I was browsing through the CASE Study Blog Hop I was excited to come across Heather's pretty embossed card. Here's my take on Heather's card, so I can link up to the CASE Study Anniversary hop! I used the new Chalk It Up papers, which were a perfect fit for the Color Throwdown combo this week. I used the sketch over at Freshly Made to define my layers. I used B&T for the base just like Heather, but I chose a bright Sorbet for my card base and embossed it with the cute new Arrows Embossing Folder. I wrapped the card base in Lagoon Hearts Washi tape. Since I didn't have watercolors at hand, I grabbed sponges instead. 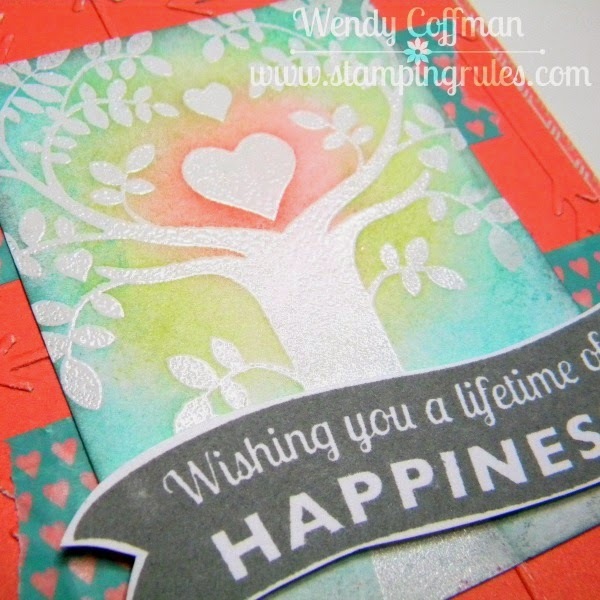 I heat embossed the tree using White Daisy Ink and Clear embossing powder. Then I sponged in rings using Sorbet, Sweet Leaf, Lagoon, and Slate Inks to get the watercolored look the Heather had in her card. I stamped the banner sentiment from Lifetime of Happiness (which might just be my favorite set right now) in Slate, cut it out, and popped it up with 3-D Foam Tape. I hope my team likes this as much as I do when we make it at our meeting! Wendy, your card is stunning! Beautiful card Wendy! Love the techniques you've used! Such pretty colours! Thanks for joining us this week at Freshly Made Sketches! Beautiful technique! Such a pretty result! Thanks for joining us at FMS! So pretty! Love the color combo and your spin off Heather's design! Thanks for joining us this week at CASE Study! Beautiful, soft colors in your design! Thanks for joining us for the Color Throwdown. Love your emboss resist panel!! On derful use of the challenges!! Thxs for joining us at CTD! What a beautiful take on the throwdown colors! Happy to see you joining us this week! Nice job! I just might have to case your case! beautiful card!